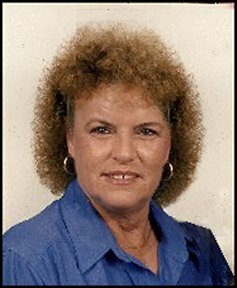 Kathryn Elaine Sons, 68, was born on May 13, 1943, in Covington, Tennessee. Her parents were Tom Ashley Williams and Ruby (Cranford) Williams of Covington. She died on April 7, 2012 in Jacksonville, Florida. She was preceded in death by her parents and one sister, Virginia Sims. She is survived by her two daughters, Karen (Kenny) McLaughlin of Jacksonville, Florida, and Crystal Martin (Karl Barnes) of Delcambre, Louisianna; four grandchildren, Breanna French, Colton and Hailey McLaughlin, and Richard Martin; two brothers, Coy (Carrie) Williams and Tom Williams of Covington, and three sisters, Sheila (Larry) Glass and Pam (Donald) Glass also of Covington, and Brenda (Danny) Sandrige of Arkansas; several nieces and nephews, and a special son-in-law, Paul Martin. She also leaves behind her beloved black cocker spaniel, Buckette. She grew up in Tipton County, Tennessee. As an electrician, she worked in Virginia, Tennessee, Massaschusetts, Colorado, and North Carolina. After she retired in 2003, she lived in Covington for a number of years before moving first to Delcambre, Louisiana, and finally to Jacksonville, Florida.